Happy New Year! Welcome to 2019 and what better way to start the year than with something different. If I’m not watching Netflix, I’m watching Amazon Prime Video. So, it makes sense to incorporate that part into my blog. As soon as Netflix sent a ‘we recommend you watch this’ in my inbox, I was spending most of my time wondering if I should watch it. It wasn’t until I was sitting in my kitchen, preparing the family buffet for New Years Eve, that I decided to give it a go. 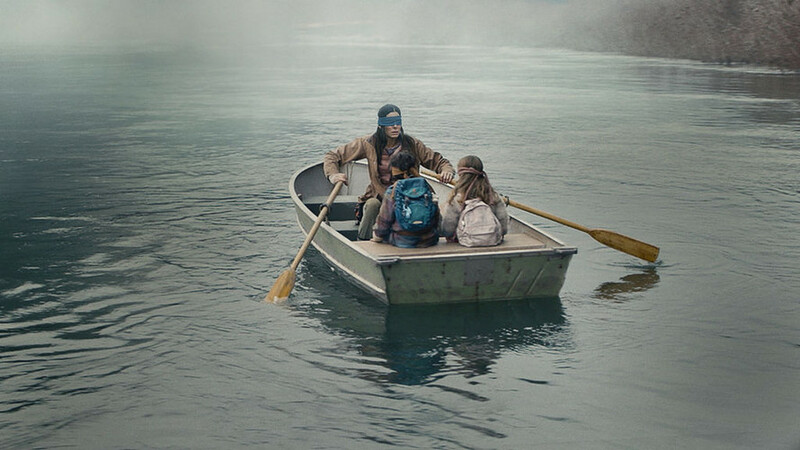 Bird Box is quite new to Netflix. Although, the concept isn’t. I found a lot of people have different ideas on films or programmes it’s similar to. Personally, I found it was a cross between The Walking Dead and an episode in season one of Dollhouse, Echoes. The film starts off with the female lead whos single and pregnant. Now, I have a preference for dramatic and action filled films/series with a strong female lead, but even I thought, ‘really, that’s how you’re going to start the film’. Sandra Bullock plays Malorie who you see on own with two children at the very start, before it jumps to five years in the past. Here you see Malorie watching a news report about an epidemic sweeping Europe, before she goes to the hospital with her sister. When she’s at the hospital, she leaves her appointment seeing a woman hitting her head against a window, repeatedly. It’s then she realises the epidemic has arrived. I don’t mind flashbacks as long as they are relevant to what I’m watching. The flashbacks are done well in this film. We get to see Malorie’s dangerous journey with a young boy and girl, dubbed Boy and Girl. Then it jumps back to how Malorie ended up on her own with the two of them. The flashback explains how it’s something that people see that causes them to want to hurt themselves. That’s why it’s so important to keep the blindfolds on. Yet, it doesn’t explain why people who have been certified as insane can see whatever it is and it doesn’t cause them any harm. The insane just want others to see, by any means possible. Malorie’s journey to the safe haven is a dangerous one. But, overall, it was a good film. Don’t get me wrong, it seemed a little over the top at times. I can understand why she was so harsh and detached from the children. It just a shame there were holes in story. Such as, who or what was causing everyone to hurt themselves. If you have a bit of free time and fancied watching a soft horror, I’d definitely recommend this film.